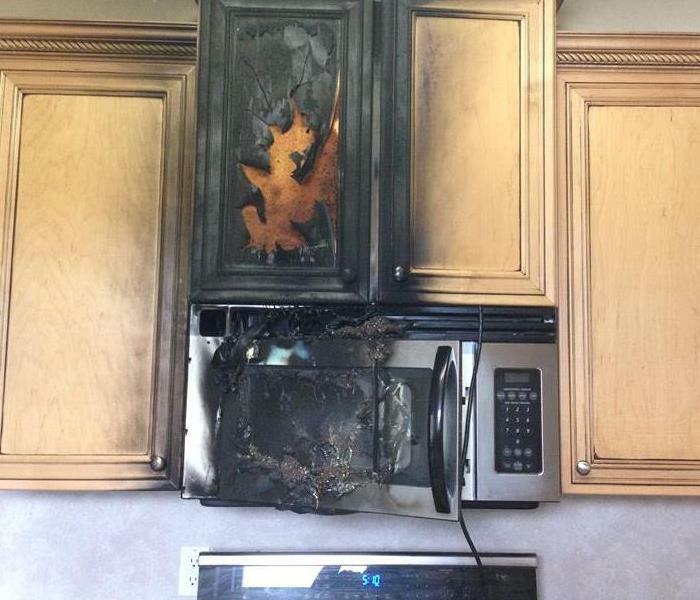 This kitchen sufferd a fire on the stove which caused microwave to go on fire and the cabinet. These emergency tips will assist you in taking proper action until SERVPRO of Greater Smithtown to arrive. Follow these Do’s and don’ts to help reduce damage and increase chances of a successful restoration. Don’t attempt to wash any walls or painted surfaces without first contacting SERVPRO of Greater Smithtown professional. Don’t attempt to shampoo carpet, rugs or upholstered furniture without first consulting SERVPRO of Greater Smithtown professional. Don’t attempt to clean any electrical appliances (TV sets, radios, etc.) that may have been close to fire, heat or water. When fire and water damage take control of your life, SERVPRO of Greater Smithtown will help you take it back. When your home or business suffers a water damage, understanding what type of water your are dealing with is critical to ensuring proper cleanup. There are three types of water. Clean water is water from a broken pipe, or other water source; rainwater is also considered clean. The term gray water is used to classify slightly contaminated water. Clean water becomes gray water when it is left untreated allowing bacteria and other contaminants to begin growing, making the water hazardous. Black water is highly contaminated and filled with fungi, bacteria, chemicals and more. Black water is typically caused by sewage damage. Flooding or any type of natural disaster. Black water should always be handled by trained professionals. Shut off the water source if possible or contact a plumber to do so. Remove as much excess water as possible by mopping and blotting. Wipe excess water from wood furniture after removing lamps and table top item. Move any paintings, art objects, computers, documents and other valuable items that may be sensitive to moisture to safe place. Do not use your household vacuum cleaner to remove water as here is potential for electrical shock or causing damage to the vacuum cleaner. Do not turn on the ceiling fixtures if ceiling is wet; do not enter rooms where ceilings are sagging from retained water. Avoid all contact with sewage and items contaminated by sewage. Wash your hands thoroughly if you come in contact contaminated items. Do not turn on the HVAC system if there is possibility of spreading contaminated air. Do not use household fans to dry structure; air flow could spread contaminants. Discard any food and/or products for personal hygiene and cleanliness if exposed to the contaminate areas. When you have a water damage, don’t leave your property to chance. Call SERVPRO of Greater Smithtown 631-265-9200. We specialize in Flooded Business Cleanup and Restoration! Have Questions about business Flooding? If flood water is not handled quickly and properly, it can jeopardize your health and safety, and cause severe damage to your business's structure. Remember, the longer you wait, the worse the problem will get. Not only that but the damage to inventory and important documents could be dramatic and irreversible. The bottom line: a flooded business can jeopardize your health, safety, and your business’s integrity. It’s worth making a call to SERVPRO of Greater Smithtown let our trained, professional crews handle the situation safely and correctly. We have earned the trust of hundreds of homeowners, business owners, and property professionals. Bathrooms are a common place for mold to occur in your home. Here are some tips on how to avoid mold in your Long Island bathroom. SERVPRO of Greater Smithtown specializes in mold cleanup and restoration, in fact, it’s a cornerstone of our business. Our crews are highly trained restoration professionals that use specialized equipment and techniques to properly remediate your mold problem quickly and safely. When it comes to SERVPRO of Greater Smithtown, our number one concern is safety: the safety of our clients and the safety of our employees. To make sure the job is done right, employees need to take proper precautions when working in specific situations. Each job comes with its own safety concerns. For example, flood waters can come with contaminants from things like sewage; mold remediation jobs come with possible irritants to people’s eyes, skin and lungs; fire damage can come with worries like smoke inhalation and possible falling debris; and biohazard incidents can come with exposure to dangerous chemicals and bodily fluids. 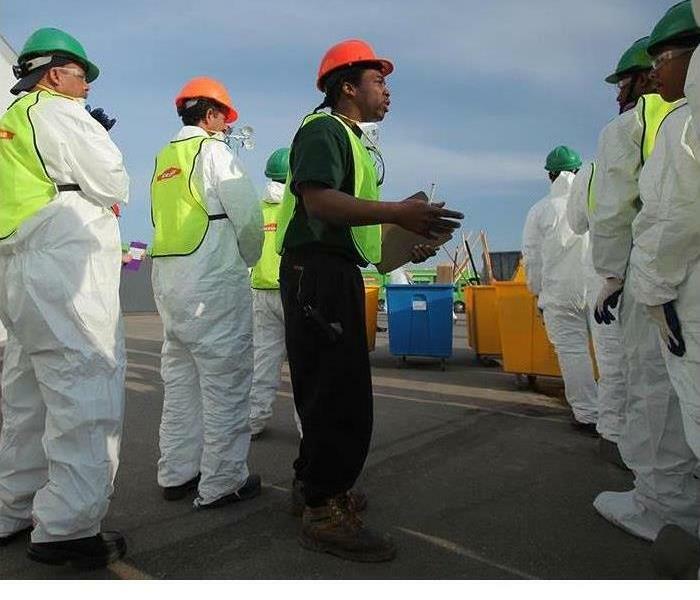 SERVPRO teams are given the proper training and personal protective equipment (PPE) to ensure they are prepared to safely handle each one of those incidents and a wide range of others. They follow specific guidelines laid out by our company and by the National Occupational Safety and Health Administration (OSHA). Tyvek Suits and Booties: which are made of a strong, but lightweight material that can protect a person from contaminants in the air. These suits cover a person from head to toe (except the face). Dust Masks: which are lightweight masks worn around the nose and mouth to keep out less serious contaminants like typical, household dust. Full Face Masks: which are more heavy-duty, plastic masks, seal off the entire face and include respirators. These are used in more dangerous conditions. The respirators filter out any harmful airborne pathogens and mold spores. Gloves: different kinds of gloves are used depending on the situation. Nitrile gloves are used to protect from certain contaminants like bodily fluids. Whereas, stronger rubber gloves are used to protect when handling sharp or rough objects. Goggles: are used to protect the eyes in dangerous conditions. Hard Hats: are used to protect employees in situations where there is a risk of building collapse or falling debris. By ensuring their own safety in the field, our team members are better able to ensure your safety and the safety of your home or business. Remember, if you experience an incident that requires restoration work, you can count on SERVPRO of Greater Smithtown to get the job done in the SAFEST and most efficient way. Call us any time at 631-265-9200. When flooding or water damage happens at your home or business, time is of the essence. The faster you call team SERVPRO for help, the less damage that unexpected water will be able to do. According to the American Insurance Association, 37% of all homes will suffer water damage each year. Of the water damage that occurs, the association says 93% of that damage is preventable. According to the association, the first 24 to 48 hours are the most crucial when dealing with water damage. The message here is that if water ends up where it does not belong, you should NOT WAIT to call for help. Getting someone on the scene ASAP will only save time and money in the long run. We’ve heard before that people will sometimes not even realize they’ve experienced a water loss until days, maybe even weeks later. For example, they may have a basement they don’t go into very often that floods. So, we recommend checking those isolated areas on a regular basis and after any major weather event, like torrential rains. Stop the source of the water: if, for example, you have a broken pipe, make sure to turn off the water supply to prevent anymore leaking. Remove items of value: move any valuables and furniture away from the water, to prevent permanent damage to those items. Take notes and photos for your insurance company. Stay Safe! Make sure to turn off any electrical connections that could pose a danger in the flooded area. DO NOT mop or towel up any water that may be contaminated, if it came from a sewer backup, for example. As we have said, time is not on your side when it comes to water damage. So, the sooner you call for help, the better! You can always contact us a SERVPRO of Greater Smithtown at 631-265-9200. We’re faster to any size disaster! Just because you haven’t experienced a flood doesn’t mean you won’t in the future. In Fact, 20% of all claims paid by the National Flood Insurance Program (NFIP) were for policies in low-risk communities. On average, Floods cost $3.5 billion in annual losses in the U.S. and commercial flood claims average more than $75,000 (NFIP). When catastrophic water damage happens to you, SERVPRO of Greater Smithtown can help. We can help you prepare ahead of time with an Emergency Ready Profile (ERP), or respond to any size disaster to begin cleanup and restoration to get you back in business as soon as possible. Hoarding disorder is a persistent difficulty discarding or parting with possessions because of a perceived need to save them. A person with hoarding disorder experiences distress at the thought of getting rid of the items. Excessive accumulation of items, regardless of actual value, occurs. Many people with hoarding disorder do not find their habits to be a problem. Hoarded items are often things others would throw away or look as junk or garbage such as old newspapers, junk mail or packaging. Hoarding can lead to homes filled with extreme clutter to full capacity from years of accumulation, making living conditions unsanitary and crowded. Bugs, fleas, rats and other vermin may be present, at which point an exterminator would need to be called. At times, hoarding may spread to the outside of the home as well, to storage facilities, or even garage or yard. SERVPRO of Greater Smithtown encounter hoarding situations several different ways. Often, SERVPRO of Greater Smithtown is called for fire or water loss and find the hoarding situation when they arrive on-site. SERVPRO of Greater Smithtown will communicate with insurance company regarding contents coverage, and after approval, contents can be packed out and possible cleaned, dried and stored by SERVPRO of Greater Smithtown or relocated to a storage facility so work on the fire or water loss can begin. Another way SERVPRO of Greater Smithtown encounter hoarding jobs is through calls from landlords, case workers, real estate agents, or family members, often after the death of a loved one. In these situations, the crew will see if they should look for any items of importance while they clean the job. Sometimes family members will come and try to help the hoarder sort through their contents as well. Each case is very different, and hoarding jobs are often sensitive situations, but SERVPRO of Greater Smithtown are here to help make "Like it never even happened." If you encounter a hoarding situation at one of your properties, or with your insureds, call SERVPRO of Greater Smithtown today. The importance of cleaning dryer vents. According to FEMA, failure to clean home dryers causes 34% of home dryer fires. Home dryer fires cause $35 million in property loss and can even cause injury or death. To reduce the risk of these fires happening in your or your insureds home or business, SERVPRO of Greater Smithtown can help clean dryer vents and ducts that may have lint buildup. Other tips for keeping your dryer vents clean from the National Fire Protection Agency include cleaning the lint filter before and after each load and making sure outdoor vent flap will open and is not restricted by snow, a birds nest, or other potential obstacles. For more information call SERVPRO of Greater Smithtown 631-265-9200 or email us and check our Facebook page.